A luxuriously rich cream with Tasmanian Extra Virgin Cold Pressed Tasmanian Hemp Seed Oil and Tasmanian Olive Oil with healing Comfrey and Calendula fresh plant extracts and MSM. 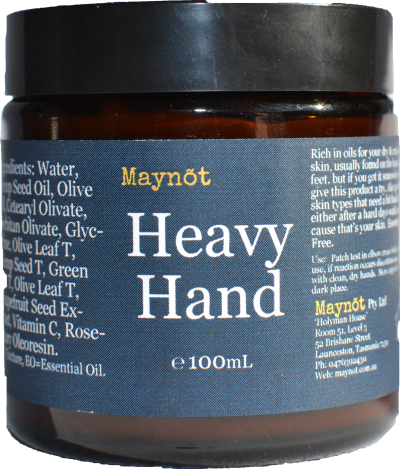 Ideal for your dry & cracked skin, usually found on the hands & feet, but if you got it somewhere else give this product a try. Also great for skin types that need a hit load of oil, either after a hard days work or just cause that’s your skin. Essential Oil Free. Use: Patch test in elbow crease before initial use, if reaction occurs discontinue use. Open with clean, dry hands. Store capped in a cool dark place.